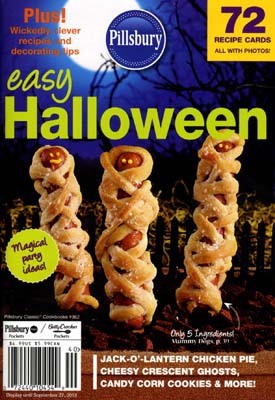 This week while checking out at the grocery store, Midge spotted the new Easy Halloween Classic Cookbook from Pillsbury. Now, normally I do not buy these because well… there is Pinterest. But this one was so cute and so full of ideas, I couldn’t resist, and happily slid it down the grocery line. Our first meal we made from this cookbook was the Halloween Chicken Pot Pie which I changed the recipe just a bit to make healthier. It was a huge hit with the family and luckily it was enough to make two pies – so we even have some leftover for lunch today. My next must have was the cute little mummys right on the cover. Midge and The Teen come home every day “starving to death” and want something quick and easy to eat right away – but not something so big that it ruins their appetite for dinner. 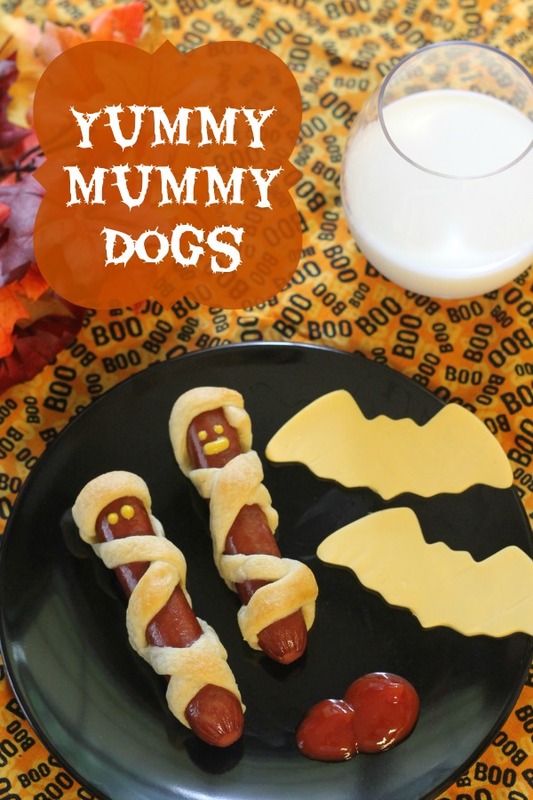 The Yummy Mummy Hotdogs were perfect… and of course I changed up the recipe just a bit. Roll out Pillsbury Original Cresent rolls onto a cutting board, mashing together precut edges to form one large flat dough. Using a sharp knife, cut into 1/2 inch long strips. Gently wrap strips of dough around hotdog – careful not to break dough. 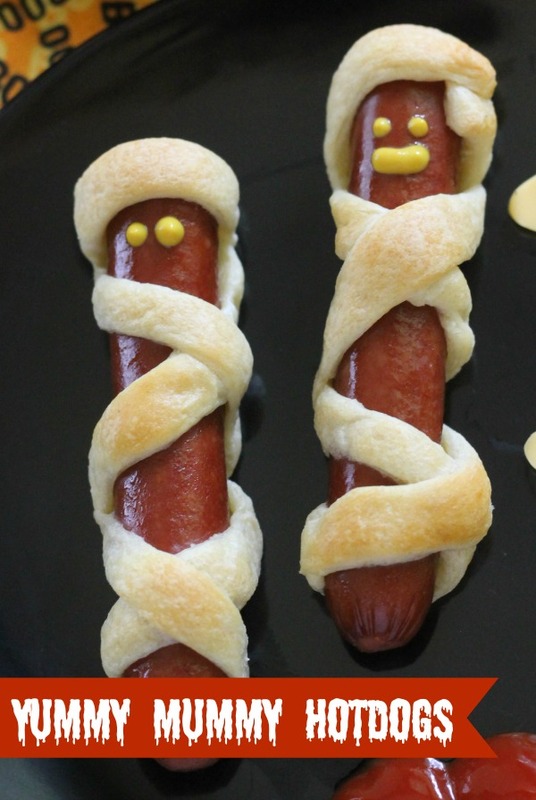 I used one strip per hotdog, but you can use more to get an even more “wrapped” look. Bake at 350* for 15-20 minutes or until cooked through and dough is beginning to brown. Decorate with mustard eyes and cookie cutter sliced cheese. These of course taste awesome – anything made with crescent rolls does – but I love how easy it is to grab one on the go. Even Mike and I enjoyed a mid afternoon snack. These are great! I’ve seen them done before, but I’VE never made them. I definitely will this year! Ha! These are SO cute! We love Halloween at our house. Putting these on my list of things to make. My kids and hubby would love this! They’re really cute! that’s so cute 😀 gonna have to try this for my son sometime. These are so cute! I will have to make them as a treat dinner for the kids one night. My kids would love to do this that’s for sure. They may actually enjoy hot dogs more. 🙂 These would be good to use at a Halloween event too. I love Mummy Dogs. I made them two years ago for our annual Halloween party. YUM!